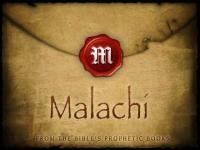 The emphasis of the book of Malachi is on God’s message to the people (God is speaking is 47 of the 55 verses of the book). If the people expect to receive the blessings God has promised they must remain faithful to Him (covenant faithfulness will produce covenant blessing). There are four primary sections: 1) Malachi points out the nations sins, 2) God provides instruction for sincere worship, 3) Justice in the form of judgement will occur if they are disobedient, and 4) There will be a day of salvation and blessing in the future for those who are faithful.